today, i’d like to ask your help with something that’s been bothering me for a while. it’s this feeling that i’m sure many of you felt: you’re walking around not looking to buy something specific, and you spot a most beautiful must-have item. you pick it up confidently and rush to the salesman or cashier only to get the biggest disappointment of your day. it comes with a huge price tag. why is it that people without the deepest pockets are deprived from surrounding themselves with beautifully designed stuff? 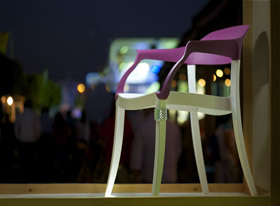 that’s the question i asked myself when i was thinking about the chair collections of one of our customers, casafekra. i realized that these guys have everything it takes to change all that. they have really gorgeous italian design chairs that are witty, simple, and completely customizable. they’re also manufactured using the highest international standards, and come with a price that’s really hard to believe compared to the market price. that’s when it hit me! these guys are creating a personal-design revolution that can change all that. at least in lebanon for now. a lot more people will get the opportunity to surround themselves with beauty that works. we all deserve it, no person more than the other. of course casafekra is selling these chairs. and it’s these sales that make a revolution sustainable on the long run. casafekra refuses to make the smallest comprise regarding the chairs. it has to be everything a design chair is, and still have an unbelievable price. to deliver “more” (see link below) than the competition, and at a much lower price, casafekra has to compromise somewhere. so they balanced the equation by reducing their profit margins. i’d like to hear from you now. how can we get this revolution to as much people as we can. i’d really appreciate any ideas or support, no matter how wild. P.S. : i’ve gotten myself 6 PUNKS for our studio, my greatest concern at first was that i wouldn’t be able to sit on these chairs all day in front of the computer. i thought they could never replace an office chair (the one with wheels and adjustable back, etc.) hanane & i were extremely surprised at how comfortable they were. even more than any of the adjustable chairs we’ve ever tried. we sat on them for as long as 12 hours straight, and we always felt really comfortable. i’d recommend these to any studio owner who wants beautiful chairs that are really comfortable, and can easily take all the beating a studio can throw at it. these are built to last. i’m sure gona blog about it 🙂 lovely! super appreciate it! here’s the link to the blog post guys! Copyright © 2000-2015 .:there for design... All rights reserved.